What do you mean by no hitting while holdling? Just a question, I am learning. I mean if you hit a horse you can't be holding it in order to hit it justly. In a herd situation if a horse crowds or moves into the space of another horse in a disrespectful manner AND the trespassed horse is a higher ranked herd member, there will be a warning. The warning will be pinned back ears, a snaked neck, a lifted leg, something, sometimes all of the above. If the offender continues the higher ranked horse will then step up the "punishment" and kick or bite the other horse until the offender stops offending the higher ranked herd member and honors its space. This kicking, or biting, is in essence "hitting" the horse. The reaction of the leader depends a lot on the action of the lower ranked horse. If the lower ranked horse forgets itself and just breezes on into the leader there WILL be an instantaneous reaction. No warning, just reaction. We can use the same concept in our dealings with horses who move into our space as well. If not, why not? 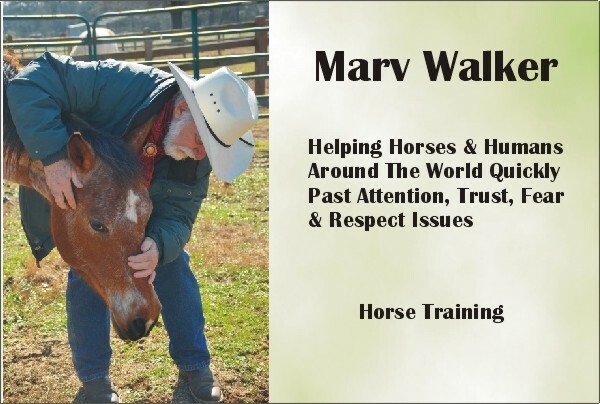 If it is a concept that horses know, accept and rely on, why can't we use that concept to help the horse operate smoothly in the human world? We tell the horse, "Annnt! I don't like that!" If the horse persists we then bite and kick. Since we are not able to physically do that we then find something we can use in place of teeth and hooves. That something can be whatever we can get a hold of or have depending on the situation. If it is disciplinary "kick" we don't want or need to leave cuts. If it is a defensive "kick" then you grab whatever you can and use it with all your might to stop the attack. But disciplinary bites and kicks can be more noise than impact to bite and kick the offender until he honors our space. Now then it is not always necessary to bite and kick. If we believe that we are actually the herd leader a mere, "Watch it!" will work. If it does not and the horse *challenges* your right to be herd leader you may step up the pressure and kick and bite. Done properly, the horse will accept what happens to him because that is the way horses treat each other in a herd situation. You are putting yourself on his level and acting in a manner he understands. But, you cannot deny him the right to say, "Okay, I got the point, you won," by moving away and honoring your space by holding him and preventing him from calling it off. We must always leave the transgressor with the ability to stop the transgression and we must honor that stopping by also stopping. You cannot hit the horse simply for the sake of hitting it. It must be in the context of a herd interaction. If it is done justly the horse will not hold it against you. It will respect and accept the discipline. If it is not done justly the horse may very well accept it anyway and not hold it against you. If you exhibit a pattern of unjust striking the horse may very well wish to keep considerable distance between you and it. The goal is to use hitting sparingly, if at all. You want to work toward being a capable enough leader who doesn't need to use force to bring about compliance. If the horse attacks or bites you, all bets are off. You need give no warnings. There is no way you can cause more damage to a horse by doing what a horse does than a horse does AS LONG AS YOU ALLOW IT TO CALL OFF THE RETALIATION. You immediately retaliate in any way you can, as loudly as you can, and as determined as you can. John Lyons oft quoted phrase is that you have three seconds to kill him. My phrase is, "Go until you are out of breath and the horse is fully convinced it has made a grave tactical error and is lucky to be alive."